Development of the Nice hotel industry. The hotel business is constantly evolving, the various establishments modernize and carry out many beautification or renovation works. By 2020 Nice will see its hotel capacity increase notably with projects that have been endorsed and for which we now know the operators. - In the city center, in the totally redesigned and refurbished neighborhood of Nice Thiers train station, a 120-room Hilton Garden Inn hotel will be set up in the future "diamond" of Nice, a hotel project of the Metropole Nice Côte d'Azur which will connect the station of Nice with the tram station Jean Médecin. The opening of the complex which will also include shops, restaurants, a gym and a theater, is scheduled for 2020. The complex has been designed by the American architect Daniel Libeskind in collaboration with the Phalsbourg Cie. The City of Nice is very pleased to welcome the first Hilton hotel of the Côte d'Azur and to attract internationally renowned operators. - The hotel Boscolo B4 Nice Park will become a 5 * Maison Albar. Located in the very center of Nice, the luxury boutique hotel complex will open at the end of 2020. Work will begin in the second half of 2018 and be completed by the end of 2020. They provide for a complete restructuring of the building and a major expansion. The urban resort will have 140 rooms and suites, a 600m2 spa, a fitness area, a rooftop with restaurant and swimming pool and meeting rooms. At the foot of the building, luxury shops will occupy the entire space. - On the site of the Hotel Comté de Nice, there will be a 4-star hotel with 7 floors and three levels of underground parking, with a specific location for a tourism coach. The building with contemporary lines will integrate with the development of the program of the South Station already engaged. The future hotel will offer 90 rooms, a restaurant brasserie of 200 places. Spa, hamman, fitness, sauna, roof terrace and swimming pool with a 360 degree view of Nice. Project estimated at nearly 10 million euros.Opening in 2021. - Nice will also be equipped with a new 5 * hotel nestled in the heart of Old Nice, historic district of the city. The Perseus Group plans to redevelop the former Convent of the Visitation built from 1604 to a luxury 85-room hotel with spa, swimming pool, restaurant and indoor patio. The historic buildings will be renovated externally to the identical according to the old materials. The Hotel du Couvent should become an address not to be missed in this historic district with a strong identity but also full of charm. An establishment that will also have the chance to be served by the two tram lines in connection with the train stations, the airport and the port. Also worth noting is the proximity of the Acropolis Congress Center, which can easily be reached on foot. No opening date announced to date. 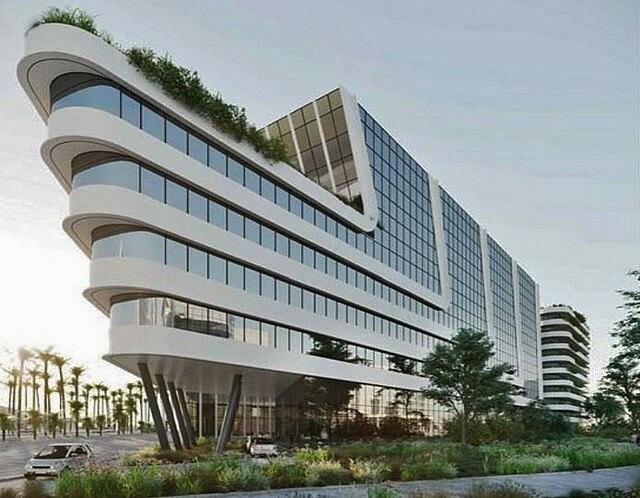 - In the Grand Arénas international business district near the Nice Côte d'Azur airport and the future Multimodal Station, two Intercontinental Group Hotel will be built in a 20,000 m2 building complex. It will be a 130-room Crowne Plaza 4 * hotel and a 3 * Holiday Inn Express hotel with 130 rooms. They will co-exist with offices and shops. They will be served by the line 2 of the tramway which will be put into service in 2018 which will bring the city center to 20 minutes and the new Exhibition Centre to 5 minutes. Also a OKKO Hotel and a MOXY by Marriott Hotel will be built (8,000 m2). - At the junction of the airport and the city, the 25,400-square-meter Airport Promenade project will include a Sheraton 4 * hotel (11,500 m2 including a restaurant, meeting center, fitness room, swimming pool and spa) with a capacity of more than 230 rooms, a residential building dedicated to certain State Airport Services (3,100 m2), offices (10,000 m2) and shops at the foot of the building (800 m2), a car park on 2 levels with a total capacity of 350 places. Delivery scheduled for 2020. In 2020, Nice will have 800 additional rooms scheduled in the only area of the Airport / Arenas, which will be complemented by the development project of the Plaine du Var with a number of establishments around the new exhibition center and stadium Allianz Riviera. In the city center, some 436 additional rooms will be built. More than 1,200 new rooms are expected by 2020 in the city of Nice!